Ambot Tik is usually made with shark fish & is a local Goan delicacy. We Goans just cannot do without our fish curry rice & ambot tik definitely is one of our top favorites! Ambot means ‘sour’ & Tik means ‘hot & spicy’ in Konkannim. In Goa, you will get to enjoy this not only on festive occasions or parties but they do serve this as a speciality in restaurants, beach shacks in North & South Goa. Some home stays also do serve this unique & special dish. To prepare ambot tik, fresh & fleshy fish with minimum bones is preferred. Shark is used because it has chunky flesh with just a single bone. The masala paste & the shark fish used to prepare this delicious gravy/sauce adds a distinct flavor of spices to the dish. Ambot Tik tastes better the next day. In fact, the flavors meld & the gravy/sauce tastes better when you keep it longer! If you love hot, sour & spicy gravies then this is it! Ambot Tik is a lip smacking & finger licking fish sauce which will not only tickle your taste buds but will be asking for more! We love this dish is an understatement. It is delicious & tastes awesome with plain steamed rice or Goan boiled rice or even better with Goan pav or any crusty bread or for that matter it is excellent with Indian broon (crusty from the outside & soft in the inside). 4 Peppercorns or ¼ tsp. fresh Black Pepper pwd. Wash the fish slices briefly & drain quickly. Apply about a ¼ tsp. of salt & keep aside for later use. Grind the ingredients listed for masala paste in a blender or masala grinder with some water to prepare a thick & smooth paste. Transfer the masala paste to a bowl; rinse the grinder jar but reserve the masala water to be used later. Heat a sufficiently deep pot/handi/dekchi with vegetable oil till hot. Reduce heat, add in the onions & sauté with a pinch or two of salt till the onions turn lightly brown. Add the prepared masala paste & sauté for a few seconds or till the rawness disappears. Add the reserved water & water to form a sufficiently thick gravy. Stir to blend in the masala paste. When the gravy comes to a boil add in the fish slices. Stir gently & let it cook on a low flame till the fish is cooked & tender. Adjust salt & sugar to taste. At this point, taste the gravy to adjust sourness. You may add in some vinegar if you prefer or some more tamarind paste. Let it simmer for another 2-3 mins. 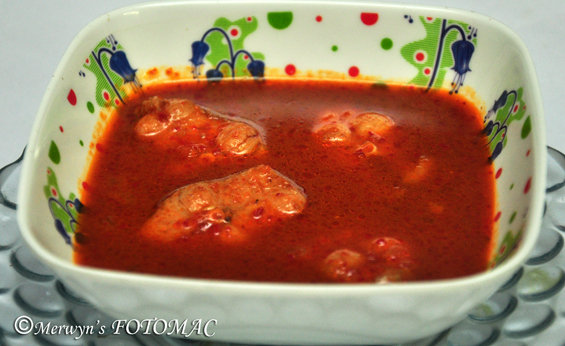 Serve the shark fish ambot tik with steamed rice or Goan boiled rice or Goan pav or bread of your choice. For a fiery ambot tik you may retain the seeds in the chillies. It is better to get the fish cleaned, skinned & sliced by the fisher monger unless you have the skills to do the skinning & slicing neatly. Always select fresh fish for any fish & sea food preparation. Ambot Tik tastes better the next day. In fact, the flavors meld & the gravy/sauce tastes better when you keep it longer!